I am in range... but Sergio is closer. If I remember correctly, we put them into one of his bikes... not sure which one, though. I do not, however have the equipment to produce the info you desire, Tony. I have not done this compression waveform data capture as I am not equipped to do so but would be interested in a before (stock) and after (Rocket Sprocket) result. Thanks, Lennie, a before and after is exactly what I had in mind. What's the availability of sprockets these days? 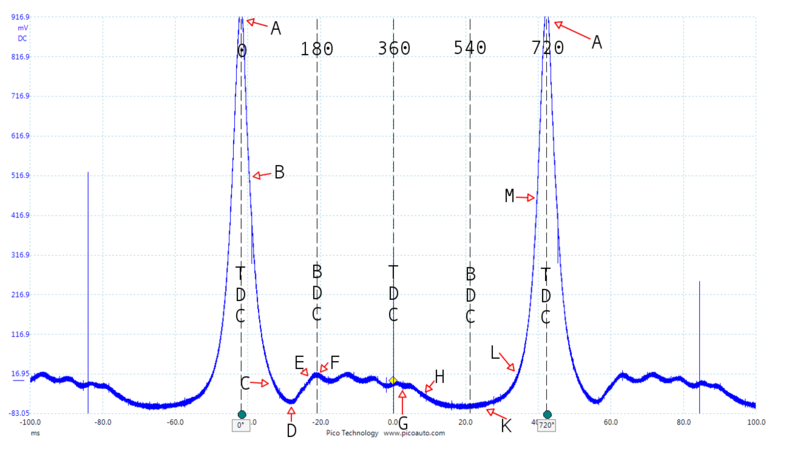 What is the equipment used to measure compression waveform data? Is this one of the piezo-electric spark plug washers to measure cylinder pressure? Is this the way designers design camshafts? I could see it in use to design pistons, squish areas. I use a pressure transducer screwed into a spark plug hole to send the signal to a digital storage O-scope. Works just like a compression gauge except it sends a signal to the scope instead of pressure to the meter. Measures volts instead of PSI. lots in stock. pm me as I can donate a set for this test. This is the actual running compression waveform. The area between the two peaks is one complete 720 degree four stroke cycle. 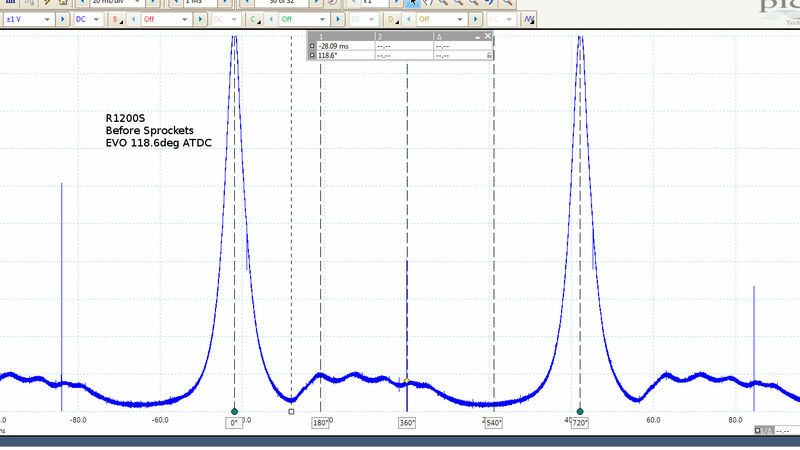 Other than the peaks at 'A' which is TDC compression stroke, the rest of the waveform is much flatter than the examples on the ATS website and from automobile engine. This test reads in-cylinder pressure. I suspect that because our bikes have virtually no intake manifold or at most a very small volume one between the throttle valve and the intake valves, and have very little exhaust backpressure to affect the in-cylinder pressures, almost the entire range of pressure readings is a little lower than auto engines. I'll try for better detail but this should actually have enough detail to see the differences in cam timing between stock and Lennie's changes. This was done with a Picoscope. Timing differences can be measured down to tenths of a degree. I also have access to that same equipment shown on the ATS site. It'll allow me to overlay the ignition and fuel injection operation on top of the valve timing data. Sorry, I just find this stuff interesting. And, just for some other information, this particular test is becoming invaluable for diagnosing engine and variable cam timing issues with a lot of the new cars- flat cams, lifters, skipped/slipped belt tooth inline or bank-to-bank and even roller tappets found with a slightly out of round rollers causing misfires. I'll post the Pico data file here later for Lennie and anyone else who wants to play with that using the Pico software. The areas of interest are where the 180 degree line falls in reference to the exhaust valve opening (D-F) and the 360 TDC line falls in reference to the overlap (near G-H). 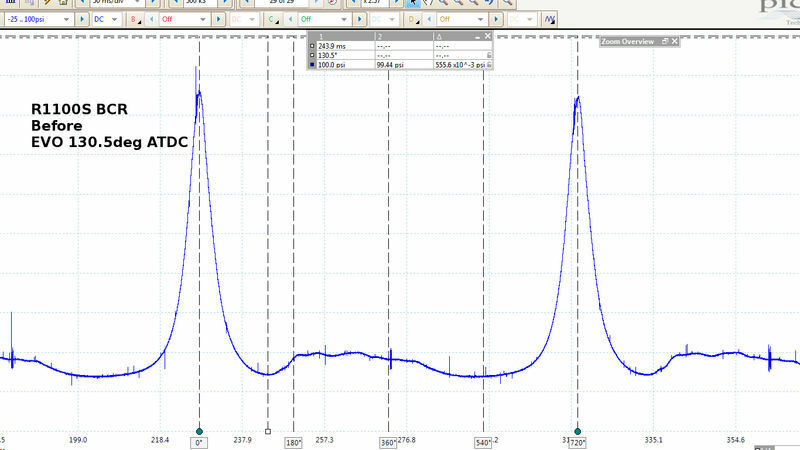 Here is the waveform from the R1100S BCR and also another from the R1200s, both having a cursor at the opening of the exhaust valve and marked in degrees. While all this stuff is cool, informative, fun and interesting, the real proof is always in the pudding. IMHO, Lennie's sprockets are where it's at for the 1100 and 1200 motors, really. No, you didn't... every single person I helped with the installation, had the same thing to say, though. Bravo! Great start. Looking forward to the next set of data. What about measuring pressure in a cylinder that is firing, at least partly. Since these are twin spark cylinders you could run on one plug (although the effective ignition timing would be retarded due to the lack of the second flame front). Good question and I don't know how to answer that question or what the advantages would be. I forwarded that question to the experts and I'll let you know what they say. Tm, One thing that would do is allow you to measure the timing and width of the combustion pressure peak which is much different in shape and well after TDC. In other words you’d get a close look at how the sprockets affected actual combustion.